Since I've been banging on about the importance of planners writing well (persuasively, cogently, concisely, imaginatively) I thought I'd share a top tip that only dawned on me recently. 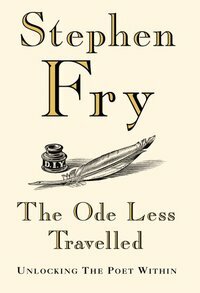 I bought a copy of Stephen Fry's 'The Ode Less Travelled' and it's perfect. I managed to get through two years of A-level Shakespeare and a lifetime of Radio 4 without ever really understanding iambic pentameter and he explained it in half an hour by making me write my own. Brilliant. And it made me realise that all the great persuasive language I've read for work had something poetic about it. Obviously it was all touched with the dead hand of commerce, but there was still a rhythm and a drive to it - something determined and crafted about the phrases. Anyone brought up in English can't help but feel the stir of the old iambic pentameter and anything written with an understanding of those rhythms is bound to be more resonant than the average bit of marketing jargon. And poetry is all about compression; about getting a lot of thought into a few words - which is something else you need to be able to do. I think I've gotten away with this kind of stuff so far because my first job was writing jokes and jokes have a kind of persuasive rhythm to them too, and I've always thought a good brief had the drive of a good joke. But poetry's probably a better, more flexible discipline; and you can learn it all from Mr Fry's marvelous book. Get it on your Christmas list while there's still time. I wrote the following about six months ago as I was first discovering advertising and account planning. "I almost liken advertisements to poems. There is such an economy of language. The words and images chosen for an ad must be powerful and exact. I am not a poet, however, so I am exploring the field of account planning. The combination of psychology, business, creative, analytic and research disciplines totally gets me jazzed." Now after being a part of the APSotW, I am realizing that if I want to succeed I will have to become a poet after all because the thinking before the execution must be as crafted and poignant as the resulting ad. What about copy? As a (danish) copywriter I've often wondered why so much writing in advertising is so loose and without rhythm. The weird idea that no one reads the actual text in the ad shouldn't be an excuse. Fry's book seems like a good read for (english/american) copywriters. Once again your advice goes beyond planning, Russell. A great spot as always Russell. I had exactly the same thought as I read the introduction to the Ode Less Travelled. The best headlines, straplines and propositions all have a poetic element to them. I think that was one thing that DDB were very good at in the 70s and 80s, especially in print ads. Their copy would flow and have a rythmn that makes people want to read it even though it was an ad. An apple falls down from the sky. Is governed by the self-same rule. Despite the fact that I can't remember my own mobile number, these V/O poems have stuck in my head for decades. Rhyme and rhythm are clearly powerful devices for building memorability. I wonder why we use them so infrequently in ads now? Probably because they seem, like jingles, old-fashioned and uncool. I think thats mainly because everyone started using them... and mostly badly. "Excuse me sir if I enquire, but isnt that your house on fire?" If you check out www.tv-ark.org.uk Neil, there's plenty of those PIF's to relight your memories! That could work well for the Pizza Hut ads, in the vein of the Maths one too. One too...one two... hehe. The trick with planning specifically is not to make something too poetic because then the creatives will reject it because it's too much like actual creative work. You want the rhythm and maybe some internal hlaf-rhymes, just enough to make it memorable and striking - but not so much that the creatives accuse you of writing taglines.